The Aviation Safety Round Table Initiative (ART), a non-governmental organization, has expressed concerns over the safety and security of Vice President Yemi Osinbajo, saying recent mishap and other events surrounding it calls for serious apprehension. In a statement signed by Olumide Ohunayo, for ART, the members also condemned the fact that a foreign pilot would command the VP’s flight where there are numerous qualified Nigerian pilots that could do the job, adding that ‘it is a slap on the huge human resource of pilots Nigeria has in abundance’. “ART join other Nigerians in thanking God for sparing the lives of the Vice President and members of his team on board the Agusta AW139 with registration number: 5N-CML and serial number : 31389 owned and operated by Caverton Helicopters which crash landed in Kabba, Kogi State with twelve (12) passengers on board, our Vice President, Professor Yemi Osinbajo inclusive. “While waiting for the AIB report of the accident, we are disturbed about the preparation made for the landing of the helicopter in that area and the crowd that surged towards the helicopter after the crash, if there had been fire, we would have experienced some casualties. 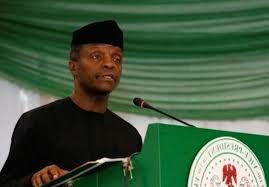 “We are deeply concerned about the management of security of the Vice President of the Federal Republic of Nigeria. It is embarrassing to see the Vice President of Nigeria being flown by a foreign pilot whether contracted or chartered in a Nigerian “Police helicopter as noticed in a previous flight during these campaign season. It is a slap on the huge human resource of pilots Nigeria has in abundance”, the ART said.